I’m gradually working my way through most of the oeuvre of the late Oliver Sacks. Two months ago I wrote about Uncle Tungsten, On the Move, and Hallucinations. Now it’s time for The Island of the Colorblind, Cycad Island, and Awakenings. Once again, all three are fascinating and worth reading. The first two of these are bound together in a single volume, partly because neither is really long enough to be a full-size book and partly because they are geographically and medically related. 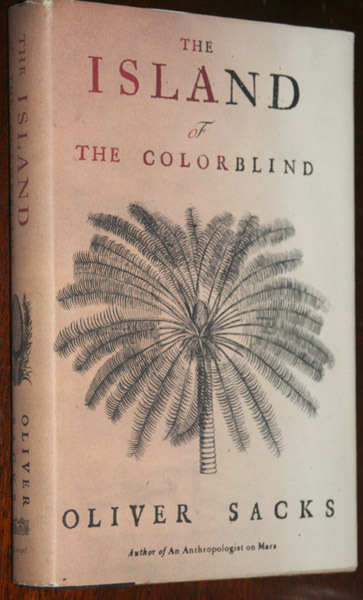 The former, as the title suggests, concerns his voyage to an island with an unusually large fraction of inhabitants who are totally colorblind: the Pacific atoll of Pingelap. Because Sacks is an excellent writer with wide-ranging interests, the reader is treated to an engaging combination of travelogue, medical treatise, and anthropological study. I’ve never been to the Western Pacific, but The Island of the Colorblind makes me feel as if I have. The second work in this volume, Cycad Island, concerns a neurological mystery on “nearby” Guam — “nearby” in terms of the vast Pacific, but actually 1200 miles! — where a significant number of older people had developed one or the other of two Parkinsonian disorders, one very much like Parkinson’s, the other more like ALS. What could cause this statistically anomalous incidence? Diet? Genetics? Something in the environment? Unfortunately Cycad Island raises more questions than it provides answers, but it’s a captivating account along the way. Since the sufferers from these disorders are no longer alive, we will probably never know the causes. Awakenings is surely Sacks’s most famous work, mostly because it was made into a popular 1990 movie starring Robin Williams and Robert DeNiro. The edition that I read (actually that I listened to as an audiobook) is especially informative as it includes detailed behind-the-scenes material on the making of the movie and a variety of stage productions. In typical Sacks style, the good doctor humanizes his medical histories through detailed anecdotes of specific patients — in this case post-encephalitics who are given L-Dopa for the first time. As a result of this miracle drug they “awaken” from decades of Parkinsonian immobility and other debilitating symptoms But then…no, no spoilers here, let’s just say that all is not a happy ending by a long shot. Go read the book yourself! Or see the movie. Or both.